Each afternoon some of the older students at the CRLC work via Skype with an Australian teacher. After watching The Staging Post, one of the most committed teachers, Lynne Samson, had them write down their thoughts about the film. I have included them in full below. I'm so proud of their writing ability. They know that they are capable, and can make a difference to their own lives. Thank you and bravo to the online students and thanks to Lynne for her commitment and ongoing support. 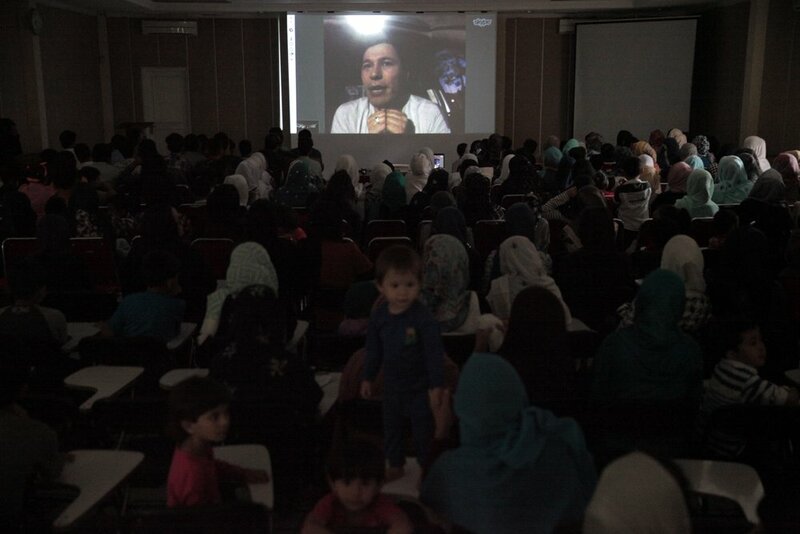 On October 12 the school invited the online class to watch a movie which had been made by Jolyon Hoff. What is it about? This was the question that chewed my brain. I wondered if it was about refugees, about our school or about misery. Before the movie started I wasn’t sure what to expect. The film nailed the audience to their seats. At the beginning, it seemed to be only about the school, but as it developed more of the life and struggles of the refugees was shown. Sixty-five minutes that showed the difficulties refugees experienced in their transit to Indonesia; that showed that refugees are not terrorists. Yesterday I saw The Staging Post. It was really amazing for me but really sad as well. Our friends Muzafar Ali and Khadim said what I want to say, that some people say to us many times that we are terroriss. They say that if you are not terrorists why did you escape, or leave your country. I say to them that like you, we are human. We are not terrorists. We had problems in our country. Nobody wants to leave their family or their country. So the film gives a message to the world that refugees are also human and they are also skilful. When I arrived here I couldn't say even a word. Fortunately now I have improved. Before the school started I hear that everyone was lazy and sad at home. Now everyone is busy at school and getting an education. We are proud of our friends that realized that refugees had skills and wanted to learn. Yesterday was the screening of The Staging Post in Cisarua. The film is the story of refugees who have had to leave their family and country. The most heart touching scene was when Khadim talks about his hat which has made by his mother and which he says, has the smell of his mother.